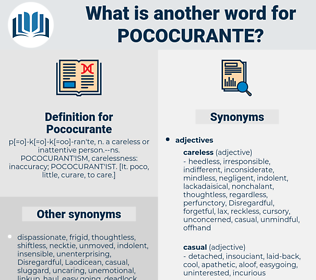 What is another word for Pococurante? 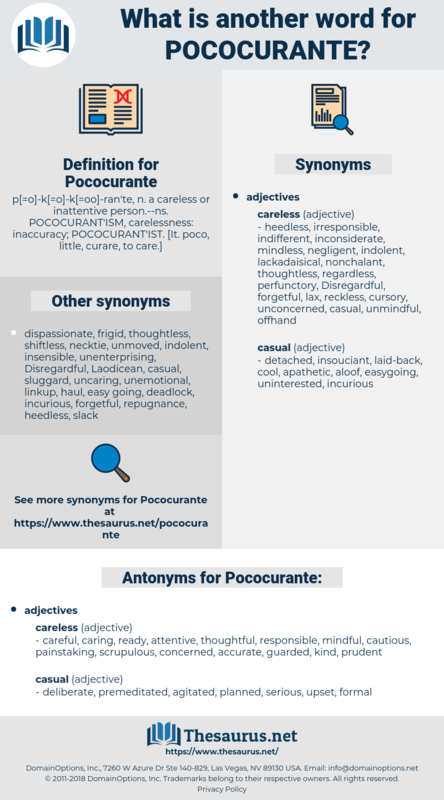 concerned, prudent, guarded, painstaking, scrupulous, thoughtful, kind, cautious, accurate, attentive, caring, careful, ready, responsible, mindful. serious, agitated, planned, upset, formal, premeditated, deliberate. heedful, zealous, ardent, conscientious, aware, warm, passionate, warmhearted, fervent, interested, sensitive, keen. There are maxims in this writer, answered Pococurante, from which a man of the world may reap great benefit, and being written in energetic verse they are more easily impressed upon the memory.
" It is not mine," answered Pococurante coolly.